San Marino, Tijuana - Just 20 minutes from the border awaits your future home tucked within the secure, gated and guarded community of San Marino. This 2-story home affords plenty of room for your family both inside and out. For the kids, there is a grassy park just a half a block from the home with the comfort of knowing there is 24 hour security exclusively for this part of the development. The main level features an open floor plan containing the living and dining room with a 1/2 bath as well as a roomy kitchen with laundry room. Sliding glass doors off the dining area grant access to your private yard perfect for the kids and pets. Plenty of windows throughout allow the natural light to flow. Upstairs await three spacious and carpeted bedrooms, each with built-in closet, including the master bedroom. An oceanview deck beckons you outside from both the master and second bedrooms. This home comes with the furnishings as well as the opportunity to expand the home, deck or build your garage. 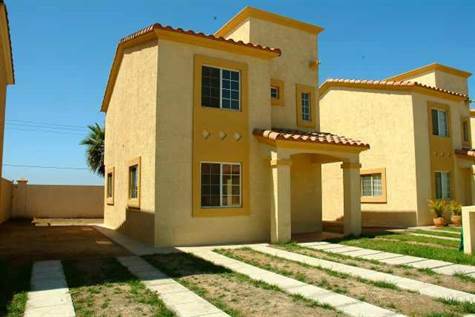 This home is perfect for anyone wanting to experience Baja while remaining a short distance from the border. With the Championship 18-hole Golf Course just 5 minutes to the north, the best surf break of Baja Malibu just 5 minutes to the west and all of the amenities of Downtown Rosarito a mere 10 minutes to the south, you'll quickly find yourself enjoying all that Baja has to offer and at an affordable price. The home is also available for rent at $650 per month or a lease to purchase. Please contact me by phone or email to learn more about how affordable it is to live near the beach with a secure, family oriented neighborhood. Come see all that is Baja!